WELCOME ABOARD THE SINGAPORE TROLLEY! Built to aesthetic perfection, the Classic Trolley is a truly inventive vehicle that harkens to the past. 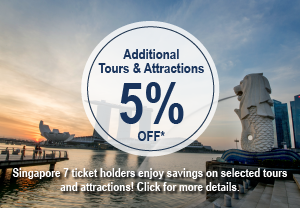 Riding on nostalgia, it immerses you in the architectural splendor of the famed ethnic quarters of Singapore, revealing fascinating stories of our unique heritage with a 3-hour fully guided sightseeing experience in English. This is a great way to see the most of Singapore within 3 hours. What's more, this flavourful tour is complete with live English commentary by a knowledge-savvy guide who will be present throughout the tour, promising an engaging and interactive experience – the only way to truly enjoy Singapore! Check out the video below for snippets of the Classic Trolley tours!